Alfred Hitchcock's PSYCHO has become such a part of the cultural consciousness that it's hard to imagine anyone today seeing the film in a spoiler-free environment. 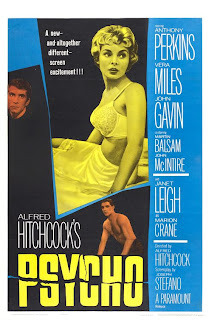 PSYCHO's key moments and iconic imagery show up on so many clip shows and have been parodied so often that everyone knows what happens when Marion Crane (Janet Leigh) stops to spend the night at the little hotel run by Norman Bates (Anthony Perkins) even if they've never seen the film itself. That it's still a movie well worth watching even without the element of surprise is a real testament to just how good it is. Released in 1960, PSYCHO marks the beginning of the modern horror film as we know it. You can thank or blame it, depending on your personal tastes, for HALLOWEEN, FRIDAY THE 13TH, and all the countless slasher films that have followed. It was also one of the key works that helped move film in general away from the restraints of the outdated Hollywood production code. It perhaps seems absurd to us now, but this was the first time anyone had seen a toilet in an American movie. Even more shocking for the time was the film's opening scene, in which the unmarried Marion is shown in the same bed as her lover Sam Loomis (John Gavin), clearly post-coitus. And of course there are the two on-screen murders. In terms of gore, these are relatively tame compared to modern films like SAW or even TV shows like CSI or LAW AND ORDER, but no one had scene anything like this in 1960. And the scenes still have impact today, thanks to the ferocity of the attacks and the absolute perfection of how they were shot and edited. Adapted from the Robert Bloch novel of the same name, PSYCHO follows the book fairly close. There are changes, to be sure: Norman in the book is an overweight alcoholic; in the film he's the rail thin Anthony Perkins, and if he's a drinker it's never mentioned. Marion Crane is built up considerably more in the film, with more suspense surrounding her theft of $40,000 from the bank where she works. All of the major scenes and plot points are carried over, but tweaked by Hitchcock and screenwriter Joseph Stefano in such a way as to work better cinematically, or to play up themes and ideas of particular interest to Hitchcock. In short, it's what a good screen adaptation of a book should be. Are there some things about PSYCHO that feel a little dated? Sure. There are a few driving scenes using the old-school rear projection technique that looks so obvious to modern eyes. The performances are all excellent, but the acting style is very much of its time. And for all of the taboos it broke in 1960, it may well feel to some as if the film doesn't go far enough (they're wrong, of course). Despite all of this, you never feel like you're watching some quaint little artifact from the past. Thanks to the skill of Hitchcock's direction, PSYCHO still has the power to thrill and enthrall an audience. He wasn't known as the master of suspense for nothing. Even the most seemingly mundane scene in the film contributes to building the tension or misdirecting the audience from what Hitchcock really has in store for them. There is not a wasted shot in the entire film. Add in the iconic performances of Perkins and Leigh, and you have a film that is rightfully considered a classic. 4 out of 4 stars.